At PRDnationwide, we’re committed to driving positive change for women in the global workplace. We support empowerment, equality and opportunity by creating an environment where all employees can reach their full potential. With the World Economic Forum's 2017 Global Gender Gap Report findings telling us that gender parity is over 200 years away - there has never been a more important time to keep motivated and #PressforProgress. For International Women’s Day 2018, we interviewed Donya St Bruno, Sales Consultant - PRD Ashmore; Cathy Cattell, Sales Consultant - PRD Hunter Valley; Helen Jens, Director - PRD Kyneton; Dr Diaswati (Asti) Mardiasmo, National Research Manager - PRD Corporate Team and Adele Fry, Office Manager - PRD Bendigo – to know their thoughts on the subject and their pledges to help accelerate gender parity in the global workplace and beyond. Question 1: What does 2018 Women’s Day means to you? Asti: This Women’s Day is about the strength that women are stronger than they think – we have the power to speak out our minds, to manage a household, bear children and give birth (men cannot do this), run successful companies, and many others. When it comes to turmoil women are usually the last one to throw in the towel or give up because we have a higher resilience to stress and able to multitask more than men – sometimes women forget this in their day to day business. One of the main things I have heard men say is “I do not know how you do it” or when their wife goes away for the weekend and leave the kids they will often say things like “oh my god thank god you’re back”. Women are strong – stronger than they realise themselves – and this needs to be put out there. Donya: I think the most important thing is that we have a day to celebrate our achievements. Since the start of international women’s day, we have come leaps and bounds – it is suddenly we have been recognised. Question 2: If you have to choose an action from this year's IWD theme, what will it be? Question 3: What do you love about your job? Cathy - I love the independence, the ability to get excellent results from hard work and also that fact that I am a business within a business. Donya - I love everything about my job, we have the best team that is a huge support. But the best part about my job is that I make a difference and I surprise people in their expectations. Helen - People, every day is different, and there is always a challenge. Adele - I love every aspect of my job; I could not imagine pursuing any other career path. There are so many different aspects of my role, and this allows me to continually challenge myself – which I thrive on! I am always learning new things and as we all know, no two days in real estate are the same, which is a great way to keep things interesting. I love my team, working with each and everyone one of them makes my day, we are a very close-knit group. Consistently meeting new clients and hearing their stories is also another part of the job I thoroughly enjoy. Question 4: Why did you choose this career path? Cathy - It has no ceiling on how much you can earn. Helen - I needed a fresh path and challenge, and it was available. Adele - To be honest, I chose this career path at a very young age and my love of all things interior design and real estate lead me to the decision. However, once entering the industry and growing into the person I am today I have realised there are so many fantastic opportunities that this career can offer. Question 5: Did you face any barriers in your career and how did you overcome them? Cathy - Initially, I faced a barrier due to my age – I came into real estate in my 40’s, but I eventually found a great boss who looked past my age and gave me an opportunity to prove myself. I did, and we formed a firm friendship which we still have today. He respected me based on my work performance and ethics rather than on my age. Helen - Being an older woman (54) when I started into a totally male sales team, was daunting. I just put my head down and got on with it. What was the point of acknowledging barriers (real or only perceived) if they actually couldn’t stop me. Adele - Initially commencing in the industry my young age was a slight barrier, however, I really didn’t let this affect me or what I wanted, I am quite mature for my age, so I really feel that this enabled me to push through this barrier, I didn’t let this hold me back. Question 6: What advice would you give to young girls who are thinking about a career in real estate? Cathy - It is a great job, but it is not a 9-5 job, you must be prepared to work long hours – there is no such thing as a day off. It can be very rewarding and is one of the non-discriminatory jobs as far as the ability to earn the equivalent wage as a male. Donya - It won’t be easy, it takes tenacity, you need to stick with it and come up through the ranks. Try to forget about making lots of money - Think about making a difference. Helen - This job is made for women, especially with our natural communication skills, our nurturing and care. It’s tough going, but if you can survive the first few years, it is worth every bit of it. Adele - My advice to young girls thinking about a career in real estate would be, do it! You won’t regret it; there are so many different ways for you to further your skills within the industry, whether this is in; property management, administration, sales, project marketing & development or in more of a management/leadership sense. Real estate is an extremely rewarding and enjoyable career. 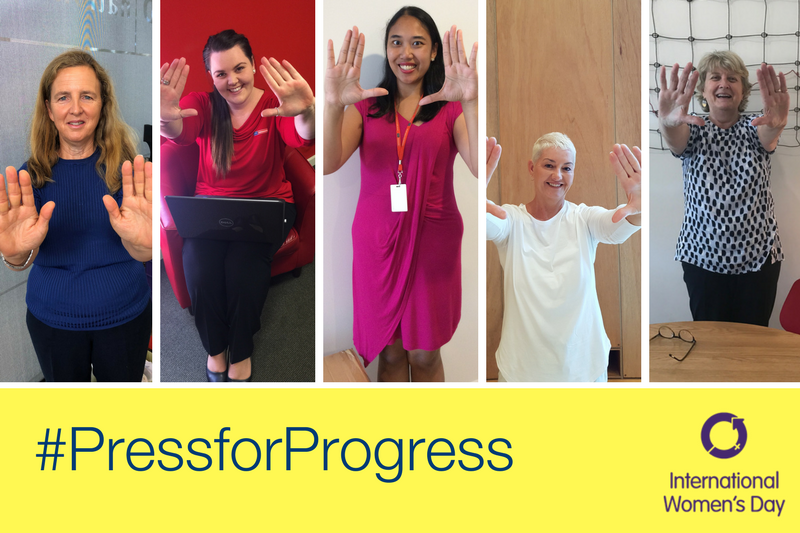 We are proud and excited to be a part of this huge vision to inspire thousands of women to #PressForProgress. Happy International Women’s Day.